Danny Rose, the Paris-based art and design collective, is returning to the seventh annual Vivid Sydney festival, the world’s largest festival of light, music and ideas, with the true “synaesthesia” of Mechanised Colour Assemblage. The group’s latest large-scale digital art installation will transform the sandstone façade of the Museum of Contemporary Art Australia into a series of sound and colour ‘machines’ to create a truly stunning, continuously morphing listening and viewing experience. 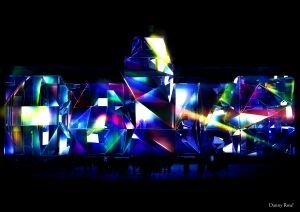 This work, a close collaboration between the creative team at Danny Rose and Australian artist Rebecca Baumann, will be one of the centrepieces of the 18-day festival of light, music and ideas that is Vivid Sydney. Rebecca Baumann is a Perth-based artist working predominantly in kinetic sculpture installation and performance. Her work is characterised by an ongoing fascination with colour, the complex workings of human emotion and the cultural rituals surrounding happiness and celebration. Her kinetic sculpture,Automated Colour Field is part of the MCA Collection, and is currently on display in the museum’s galleries. Mechanised Colour Assemblage uses 3D projection mapping technology to project the machine images onto the MCA façade, with the artists working closely with composer Emanuele de Raymondi. Projection technology will be supplied and supported by TDC, Technical Direction Company. Danny Rose’s Play Me!, the interactive 3D projection mapping piece from last year’s Vivid Sydney event, recently picked up the prestigious Judges Choice Award at the DIGI Awards 2015 in New York City, a recognition of the group’s innovative use of technology and mass audience engagement.